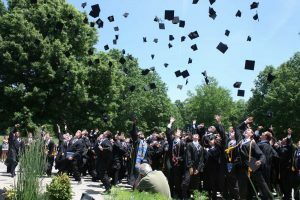 Malvern Prep 2016 graduates celebrate during this week’s commencement ceremony. MALVERN – Malvern Prep’s 90th Commencement was held today under beautiful skies at Wolfington Plaza on the School’s Chapel lawn, as the Malvern community paid tribute to the 115 seniors of the Class of 2016 for their accomplishments, commitment to service and the strong bonds of brotherhood that they have formed. Next to talk was Commencement Speaker the Rev. Donald F. Reilly, O.S.A., D.Min., Malvern Trustee, President of St. Augustine Prep and former Prior Provincial of the Province of St. Thomas of Villanova. Reilly noted that these graduates are the beneficiaries of a Catholic, Augustinian education grounded in the 2,000-year history of the Order. He picked up on Salinas’ reference of service and spoke about the overarching Augustinian value of caritas – what he defined as seeing the face of God through loving service. Reilly shared his remarkable story of his unexpected and transformative experience with someone infected with HIV. In 1986, one of Reilly’s close friends died of AIDS. To honor his friend and to give back in a meaningful way, he signed up to support someone afflicted by HIV. He did not expect that he would be paired up with a 12-month old boy. He was not prepared. He thought about quitting, but he took care of this baby who was in foster care, and watched him grow. The visits continued over the years, even after doctors said that he would not live another because of neurological defects. This year, that child received his master’s in social work from Smith College. The relationship changed Reilly. The experience made him empathetic more than he ever was. He said that when you have empathy for another, you leave the world of black and white and reside in the gray, the place where decisions are not easy. Malvern’s commencement ceremony began at 10:00 a.m. with a Baccalaureate Liturgy, presided over by the Rev. Jim Flynn, O.S.A., Malvern President, and featured musical selections throughout by the Liturgical Music Group and Band Ensemble. The Commencement ceremony began with the Class Speaker and Commencement Address, and included a number of Academic Excellence and Memorial Awards (below) before the conferring of diplomas by Fr. Flynn, Head of School Christian Talbot, and Assistant Head of School Steven Valyo ’70. The formal ceremony ended with a final blessing by Fr. Flynn before the traditional cap toss around the statue of St. Augustine at the entrance to campus. In addition, on Wednesday morning at the Senior-Parent Awards Breakfast, a special award and scholarship was given to Michael Narzikul (Media) – the Michael P. Finnegan ’81 Scholarship, given in memory of the man who dedicated his student years to the service of the school, and who later served as Malvern’s alumni director, theology teacher, and who continued to remain involved in campus ministry and the spiritual life of the school.